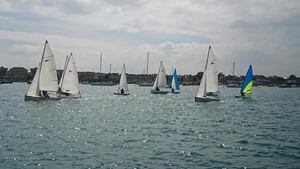 Ten boats entered today’s Baring Cup race around Portsmouth harbour. A mixed fleet of Bosuns, Picos, Fusions and Lasers competed in the hour long race in wall to wall sunshine and 6-8kts Southerly breeze. Racing was close throughout with boats changing places numerous times. Pat Law (Bosun) pulled off a masterful ‘port flyer’ on the start line north of Shell Pier having spotted the bias. Cdre Ian Annett (Laser) meanwhile executed a flawless start one minute behind the rest of the fleet following a minor timekeeping error. The starboard side of the first beat was undoubtedly favoured with several boats tacking furiously through the moored yachts to keep out of the flood tidal stream. From there it was a run back to the start followed by a reach towards Portchester. The wind became lighter in the lee of Whale Island and again the starboard side of the beat paid with more wind to the South West. From there it was a reach back to the finish line at RNWAC with only 13 mins between 1st and 10th places on the water. On corrected time the difference was reduced to 7 minutes. Prizes were presented in the RNWAC by RNSA Commodore RAdm Chris Gardner who very kindly also gave up his time to drive the safety boat for the event. Lt Dom Jacobs (HMS DIAMOND) took 3rd place behind Lt Alex Thompson (FSU) in 2nd. Amid cries of “Fix!” and questions about the Fusion’s true handicap, RNSA(P) Dinghy Rep and race organiser Lt Matt Irwin (MWS) took 1st place. The sailors then gathered in the marquee for a drink, dit session about the day’s race and to hatch new plans for upcoming races. Thanks go to Lee and Ken Bichard for organising the day’s racing and to all the RNWAC staff for ensuring the boats remain in top condition. Upcoming events in the RNSA(P) calendar include the final 2 Thursday series races on 12 &19 Jul - rig a boat and be at the race brief at 1715 if you’d like to join in. Looking further ahead is the Fleet Commander’s Cup on Wed 12 Sep. This will be the last major fleet race in Bosuns before they are retired next year and replaced by RNSA owned Hartleys and Fusions. Standby for details on the RNSA website and RN Dinghy Sailors Facebook page.